I have been trying my best to keep an open mind on this President of the US. BUT there is just so much that we as American's that treasure our country should have to stand by and put up with!! We heard the tapes of him being an absolute disgrace talking about women and how he wanted to do disgusting things to women before the election. We have heard a NUMBER of things since then when he hit the White House being sworn in. I have tried to just live my life and keep going and be the happy go lucky woman that I am and just enjoy life and I do intend to keep on doing that HOWEVER, there has been so much going on in the few months of this year since he was sworn in that there needs to be SOMETHING DONE!!! Not later and not well we will look into it etc BUT NOW!!!! Just how much are we supposed to sit here and take in???? How are we supposed to continue to live our lives and do our daily routines and raise our children right in this country when the OWN person running this country is not only a Liar but, also a ton of other things that aren't good things and the list goes on! I won't bore you with the details you can simply look up anywhere and see what he's done and said about everyone in this country!!! About women, our special needs children, our media, our vets and our senior citizens to name just a few!!!! This idiot that doesn't know how to tell the truth NO matter what is not only making himself look like a complete IDIOT that doesn't konw anything about this country nor its history and he's making himself look like a complete nut cracker that needs to be locked up in a damn funny farm but, it is also making the rest of us look like idiots because we haven't stepped in and up and put him in his place and that is OUT of our White House and OUT of being in charge of this once great country!!!! There are so many things that just aren't right and if ANY other person in this country even did a 1/4th of what he's done so far, they would be in prison right now!!! Why are we allowing and continuing to let him get away with this crap?? Why are we allowing him to continue to open his mouth & give not only the Russians secret info but, then he decides that he is going to yet again open his mouth and tell another country of the locations of our Nuclear Subs!!! For real???? And they gave us the transcript to show us that!!!!!! And then he goes on to deny things that he has said 10 mins ago!!! WHY is he still anywhere near the White House??? WHY is he NOT in prison where anyone doing the things that he has done would be??!!! There is a fine line between being President and taking on the role as a serious job and another line where you THINK that you are ABOVE everyone else INCLUDING the damn law because you are the President!!! This is unacceptable and ridiculous and for anyone that thinks that he isn't or hasn't done any wrong doing, I feel for you because apparently you are just blind to what is right in front of your eyes, so please OPEN them and realize what this person is doing to not only himself but, this country and you and your family and kids and friends etc!!! We need to continue to get this out there and tell people our opinions and YES I will continue to now and again give my two cents on this situation and what I think about it!! He ordered someone to put the media in jail!! For what?? Asking questions that he doesn't want to answer? For printing and telling the TRUTH that the American people deserve to know and hear and read!!! Something is WRONG with that picture!!! So I will continue without any doubts in my mind to write about any and EVERYTHING that I choose to write about because that is one of my rights and I am going to use it to the fullest of my power!!!! And anyone who tries to step in and undo that power deserves to have consequences for their actions!!!!!! 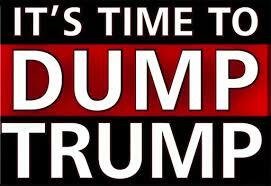 So I say here today again....DUMP TRUMP!!!!!!!!!!! !